Purpose: To evaluate the influence of at least three abutment disconnections in conventional loaded implants against placement of a definitive abutment in immediately non-occlusal loaded implants on hard and soft tissue changes. A secondary aim was to evaluate whether the presence of less than 2 mm of keratinised mucosa is associated with increased peri-implant marginal bone loss and soft tissue recessions. 3. At delivery of the definitive prostheses (repeated disconnection or conventional loading group). Patients were treated at four centres and each patient contributed to the study, with only one prosthesis followed for 3 years after initial loading. Outcome measures were: prosthesis failures, implant failures, complications, pink aesthetic score (PES), buccal recessions, patient satisfaction, peri-implant marginal bone level changes and height of the keratinised mucosa. Results: Forty patients were randomly allocated to each group according to a parallel group design. Six patients from the definitive abutment group dropped out or died, and one left from the repeated disconnection group. One implant, from the repeated disconnection group, fractured (difference = 3%; CI 95%: -2%, 8%; P = 1). Four provisional crowns and one definitive single crown had to be remade because of poor fitting, and one definitive crown and one definitive prosthesis because of ceramic and implant fracture, respectively, in the repeated disconnection group vs one provisional prosthesis from the definitive abutment group due to frequent debondings (difference = 15%; CI 95%: 2%, 28%; P = 0.060). Five patients from the definitive abutment group and four patients from the repeated disconnection group were affected by complications (difference = 4%; CI 95%: -11%, 20%; P = 0.725). PES scores assessed at 3 years post-loading were 11.7 (standard deviation = 1.8) mm for the definitive abutment group and 11.3 (1.5) mm for the repeated abutment changes group (difference = 0.4; CI 95%: -0.4, 1.2; P = 0.315). However, there was a difference of 0.26 out of a maximum score of 2 in favour of the definitive abutment group for soft tissue contour only. Buccal recessions at 3 years post-loading amounted to -0.1 (0.8) mm for the definitive abutment group and -0.1 (1.2) mm for the repeated abutment changes group (it was actually a soft tissue gain; difference = 0.01 mm CI 95%: -0.48, 0.50; P = 0.965). All patients declared being very satisfied or satisfied with the function and aesthetics of the prostheses and said they would undergo the same procedure again, with the exception of one patient from the repeated disconnection group who was uncertain regarding function. Mean peri-implant marginal bone loss 3 years after loading was 0.07 (0.18) mm for the definitive abutment group and 0.50 (0.93) mm for the repeated abutment changes group (difference = 0.43 mm; CI 95%: 0.13, 0.74; P = 0.007). The height of keratinised mucosa at 3 years post-loading was 2.8 (1.3) mm for the definitive abutment group and 2.8 (1.6) mm for the repeated abutment changes group (difference = 0.03; CI 95%: -0.67, 0.73; P = .926). Up to 3 years after initial loading there were no statistically significant differences between the two procedures, with the exception of 0.4 mm more marginal bone loss at implants subjected to three abutment disconnections. There were no significantly increased marginal bone loss (difference = 0.1 mm, CI 95%: -0.3, 0.5, P = 0.590) or buccal recessions (difference = 0.1 mm, CI 95%: -0.4, 0.7, P = 0.674) at implants with less than 2 mm of keratinised mucosa at loading. Conclusions: Three-year post-loading data showed that repeated abutment disconnections significantly increased bone loss of 0.43 mm, but this difference may not be considered clinically relevant; therefore clinicians can use the procedure they find more convenient for each specific patient. Immediately non-occlusally loaded dental implants are a viable alternative to conventional loading and no increased bone loss or buccal recessions were noticed at implants with less than 2 mm of keratinised mucosa. Conflict of interest statement: This trial was partially funded by Dentsply Sirona Implants, the manufacturer of the implants and other products evaluated in this investigation. However, data belonged to the authors and by no means did the manufacturer interfere with the conduct of the trial or the publication of the results, with the exception of rejecting a proposal to change the protocol, after the trial was started, allowing the use of indexed abutments. Purpose: To evaluate the efficacy of short (5 or 6 mm long) dental implants vs 10 mm or longer implants placed in crestally lifted sinuses. Materials and methods: Twenty partially edentulous patients with 5 to 7 mm of residual crestal height and at least 7 mm thickness below the maxillary sinuses as measured on computed tomography scans were randomised according to a parallel group design to receive either one to two 5 or 6 mm long implants (10 patients) or 10 mm long implants (10 patients) after crestal sinus lifting and grafting with anorganic bovine bone. Implants were left to heal submerged for 4 months and were loaded with reinforced acrylic provisional prostheses, replaced, after 4 months, by definitive provisionally cemented or screw-retained metal-ceramic or metal-composite prostheses. Outcome measures were: prosthesis and implant failures, any complications, radiographic peri-implant marginal bone level changes, and patient's satisfaction assessed by blinded assessors, when possible. All patients were followed up to 3 years after loading. Results: Two patients from the augmented group dropped out after the 1-year follow-up. No implant or prosthesis failure occurred. One short implant patient was affected by two complications vs one complication in the long implant group. There was no difference for patients experiencing complications between the two groups (difference in proportions = -0.03 %; 95%CI: -0.32 to 0.27; P = 1.000). Short implants lost 0.89 ± 0.25 mm and long implants lost 1.08 ± 0.29 mm of peri-implant marginal bone 3 years after loading, the difference between the two groups being not statistically significant (difference = -0.19 mm; 95%CI: -0.46 to 0.09; P = 0.165). All patients were fully or partially satisfied with function and fully satisfied with aesthetics. Conclusions: Both techniques achieved excellent results and no differences were observed between prostheses supported by one to two 5 or 6 mm long implants vs 10 mm long in posterior atrophic maxillae up to 3 years after loading; therefore it is up to clinicians to decide which procedure to use, although longer follow-ups with larger patient populations are needed to better understand if one of these procedures could be more effective in the long-term. Conflict of interest statement: this study was partially supported by Zimmer Biomet. However, data property belonged to the authors, and by no means did the manufacturer interfere with the conduct of the trial or the publication of its results. 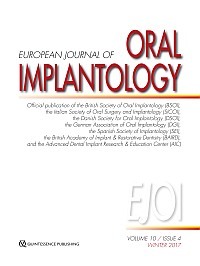 Agrawal, Kaushal Kishor / Rao, Jitendra / Anwar, Mohd / Singh, Kalpana / Himanshu, D.
Purpose: To compare the outcome of dental implants placed following full-thickness flap surgery with flapless surgery in controlled type 2 diabetic patients. Materials and methods: A total of 92 controlled type 2 diabetic patients, who needed missing mandibular first molars to be replaced by implants, were selected for a single-centre, parallel group, double-blinded randomised controlled trial. Patients were randomly allocated into two groups: flap (46 patients) vs flapless (46 patients) implant placement. Implants were loaded with metal-ceramic crowns, 4 months after placement in both groups. Outcome measures: Implant and crown success, complications, post-operative pain and swelling, plaque index, sulcular bleeding index, pocket depth and HbA1c level. Follow up examinations were made after 24 h, and on the third and seventh days for soft tissue healing, pain and swelling evaluation; then at 6 months and 12 months (after loading) for dental plaque, sulcular bleeding, pocket depth, and HbA1c level evaluation. Results: After 16 months of implant placement, no dropouts occurred. Five implants failed, two in the flap group and three in the flapless group (4.34% vs 6.52%, McNemar test P = 1, difference = 0.4457, 95% CI of difference = 4.554 to 47.234). Seven prosthesis failures occurred, three in the flap group and four in the flapless group (McNemar test P = 1; difference = 0.4239; 95% CI of difference = 29.95 to 3.86). Two patients in each group were affected by complications. There were statistically insignificant differences in the incidence of complications between the groups (McNemar test P = 1; difference = 0.457; 95% CI of difference = 90.75 to 5.33). After 24 h, the flapped group patients showed significantly greater pain compared with the flapless group (24 h: P = 0.017, difference = 0.37 and 95% CI = 0.673 to -0.067). After the third and seventh postoperative days, the mean pain level in both groups decreased linearly after the treatments (third day: P = 0.183, difference = 0.19 and 95% CI = -0.472 to 0.092; seventh day: P = 0.225, difference = 0.09 and 95% CI = -0.237 to 0.056). The frequency of post-operative swelling "some + a lot" at the third day was significantly higher in the full thickness flap group compared with the flapless group (P = 0.002, difference = 0.1835 and 95% CI = -0.0409 to 0.4079). Most of the cases in either of the study groups demonstrated no swelling (P =1.00, difference = 0.00 and 95% CI = -0.3034 to 0.3034) on the seventh post-operative day. The mean plaque index (6 months: 1.00 ± 0.47 vs 0.83 ± 0.79, P = 0.230, difference = 0.17 and 95% CI = -0.450 to 0.110 and 12 months: 1.30 ± 0.67 vs 1.04 ± 0.86, P = 0.123, difference = 0.26 and 95% CI = 0.593 to 0.073), mean sulcular bleeding index (6 months: 1.40 ± 0.52 vs 1.04 ± 0.83, P = 0.018, difference = 0.36 and 95% CI = 0.658 to 0.062 and 12 months: 1.90 ± 0.48 vs 1.17 ± 0.57, P = < 0.001, difference = -0.73 and 95% CI = -0.958 to -0.503) and pocket depth (6 months: 1.30 ± 0.26 vs 1.17 ± 0.25, P = 0.021, difference = -0.13 and 95% CI = - 0.240 to- 0.012 and 12 months: 1.95 ± 0.28 vs 1.56 ± 0.17, P = < 0.001, difference = -0.39 and 95% CI = -0.490 to -0.290) in both groups increased after the treatment and the increase was evident higher in full thickness flap group than flapless group. Conclusions: On the basis of these results, it was concluded that flapless surgical technique could be considered for dental implant placement in type 2 diabetic patients to reduce post-operative pain and swelling. Purpose: To evaluate clinical safety and effectiveness of a novel calcium-incorporated titanium implant (Xpeed, MegaGen Implant Co. Limited, Gyeongbuk, South Korea). Materials and methods: In total, 60 patients were randomised to receive one to six titanium implants in the maxilla with either calcium-incorporated (Xpeed) or control resorbable blasted media (RBM) surfaces, according to a parallel group design at two centres. Implants were submerged and exposed at three different endpoints in equal groups of 20 patients at 12, 10 and 8 weeks, respectively. Within 2 weeks, implants were functionally loaded with provisional or definitive prostheses. Outcome measures were prosthesis failures, implant failures, any complications and peri-implant marginal bone level changes. Results: A total of 30 patients received 45 calcium-incorporated implants and 30 patients were given 42 control titanium implants. Five years after loading, eight patients dropped-out from the Xpeed group and nine left the RBM group. No prosthesis or implant failures occurred. Two patients were affected by three complications in the Xpeed group vs five patients from the RBM group, who experienced eight complications; the difference between groups being not statistically significant different (P = 0.187; difference in proportions = 14.7%; 95% CI: -10.7% to 39.4%). Five years after loading patients with Xpeed implants lost on average 1.19 ± 0.48 mm of peri-implant marginal bone vs 1.43 ± 0.98 mm of patients with RBM implants, the difference being not statistically significant (P = 0.35; mean difference: -0.23 mm; 95% CI: -0.73 to 0.27 mm). Conclusions: Both implant surfaces provided good clinical results and no significant difference was found when comparing titanium implants with a nanostructured calcium-incorporated surface with implants with an RBM surface. Conflict-of-interest statement: MegaGen partially supported this trial and donated the implants and prosthetic components. The study design was negotiated with MegaGen Implant Co, Gyeongbuk, South Korea, however, data property belonged to the authors and by no means did MegaGen interfere with the conduct of the trial or the publication of its results. Purpose: To compare the outcome of implants inserted in maxillary sinuses augmented with anorganic bovine bone (ABB) grafts vs mixed 50% ABB and 50% autologous bone graft, using a lateral window approach. Materials and methods: This study was designed as a randomised controlled trial of parallel groups. Patients in need of an implant-supported prosthesis in a maxillary posterior area with a residual alveolar bone height no greater than 4 mm (range 0-4 mm) were recruited for lateral sinus grafting. Patients were randomly allocated to receive 50% ABB and 50% autogenous bone (group A) or 100% ABB (group B). After 7 months, tapered implants were inserted with an insertion torque between 20 and 45 Ncm. After 3 months, implants were loaded with screw-retained temporary crowns. Definitive crowns were delivered 3 months later. Outcome measures were implant survival, complications, radiographic marginal bone-level changes, probing pocket depths (PPD) and bleeding on probing (BOP). Clinical data were collected at definitive prosthesis delivery, 1 and 2 years after loading. Results: Thirty-two consecutive patients were treated with 32 sinus lift procedures (16 group A, 16 group B). A total of 46 implants were installed. No patient dropped out. No crown/implant failed by the end of the study. Three complications (one sinus membrane perforation and two chipping of the ceramic) were observed in three patients in group A, vs none in group B (RR 0.81; 95% CI 0.64 - 1.03 mm; P = 0.225). At the 2-year after final loading follow-up, the mean marginal bone loss was 1.18 ± 0.50 mm (95% CI 0.95 - 1.45 mm) in group A and 1.28 ± 0.48 mm (95% CI 0.97 - 1.43 mm) in group B, with no statistically significant differences between the two groups (difference 0.11 ± 0.22 mm; 95% CI -0.06 - 0.16 mm; P = 0.586). At the same follow-up, the mean PPD value was 2.70 ± 0.39 for group A and 2.54 ± 0.66 for group B, with no statistically significant difference between groups (difference 0.17 ± 0.39 mm; 95% CI 0.06 - 0.32 mm; P = 0.456), while the mean BOP value was 1.21 ± 0.79 for group A and 1.28 ± 0.68 for group B, (difference: 0.06 ± 0.49 mm; 95% CI -0.23 - 0.25 mm; P = 0.297). Conclusions: Within the limitations of this study, the present data seem to confirm the hypothesis that the clinical outcome of implants inserted in sinuses grafted with ABB vs implants inserted in sinuses grafted with mixed 50% ABB and 50% autologous bone are comparable. Conflict-of-interest statement: This study was not supported by any company. All the authors declare no conflict of interest. Purpose: The aim of this study was to compare clinical and radiographic bone level assessments to intra-surgical bone level registration around implants with peri-implantitis and to identify the clinical variables rendering peri-implant bone level assessment accuracy. Materials and methods: The study sample included 50 implants with peri-implantitis in 23 patients. Registration methods included probing of the vertical distance between the implant/abutment interface and the bottom of the pocket (= VPD), intraoral radiography, bone sounding without flap elevation and intra-surgically assessed interproximal bone level. The latter was considered the true bone level (gold standard). Twenty clinicians evaluated all radiographs. Results: VPD and intraoral radiography resulted in a significant underestimation of the true bone level by 1.0 mm (95% CI: 0.495-1.585; P < 0.001) and 2.3 mm (95% CI: 1.650-2.980; P < 0.013) respectively. Bone sounding without flap elevation did not differ significantly from the true bone level (mean difference 0.2 mm; 95% CI: -0.775 - 0.335; P = 0.429). Duplicate magnification registration of 50 implants resulted in excellent intra- and inter-rater reliability (ICC intra ≤ 0.99; ICC inter = 0.964; P < 0.001). Radiographic underestimation was significantly affected by defect depth (P < 0.001). Variation among clinicians was substantial (mean underestimation range 1.1 mm to 3.8 mm); however, clinical experience had no impact on radiographic underestimation (P = 0.796). Conclusions: Bone sounding without flap elevation was the best predictor of peri-implant bone level, whereas intraoral radiography was the most inferior. Consequently, peri-implantitis may be under-diagnosed if examination is only based on radiographs. Conflict-of-interest statement: Prof Hugo De Bruyn is associated with education and research collaboration agreements with Dentsply Sirona and Southern Implants, on behalf of Ghent University. Prof Cosyn has a collaboration agreement with Nobel Biocare. All other authors declare that they have no conflict of interest. Purpose: To evaluate a possible association between the inter-implant distance and the papilla deficit. Additionally, the effect of high or low contact points of the crowns on the papilla deficit was investigated. Materials and methods: Periapical radiographs taken 1 year after loading were used to assess the distance from the shoulder of the implant to the adjacent tooth or implant. On the clinical images, the interdental papilla height, soft tissue deficit and crown length were evaluated. The papilla crown proportion and the proportion of the height of the contact point to the crown length were assessed. Results: Eighty-one patients, with a total of 104 zirconia implants and 208 measurements were involved in this cross-sectional survey. Considering patient means, the correlation between the papilla deficit and the interproximal distance, respectively inter-implant distance, was very low (r = -0.05220; P = 0.6435, N = 81). Logistic regression at implant-level showed that there was no significant difference in the likelihood for a papilla deficit between a high and a low contact point of the crowns with P = 0.8191 (Odds ratio: 1.106 with 95%CI 0.461; 2.654). Conclusions: Horizontal interproximal dimensions around zirconia implants showed very weak influence on the papilla height. A high or a low contact point position of the crowns did not affect the papilla deficit. Conflict of Interest and sources of funding: All authors reported no conflict of interest. There were no sources of funding for the research. Purpose: To examine differences in morphology and in immunophenotype subsets between chronic periodontitis (CP) and peri-implantitis (P-I) lesions and to test the diagnostic agreement (CP vs P-I) among three independent observers, based on histopathological features. Materials and methods: This observational cross-sectional study included 15 gingival biopsies of CP lesions and 15 biopsies of P-I lesions for double-blinded examination by three independent pathologists. Inflammatory infiltrate intensity was assessed semiquantitatively on a 4-point scale, determining the percentage of lymphocytes, plasma cells, monocytes/macrophages, and granulocytes and the presence/absence of bacterial colonies. Immunohistochemical analyses were performed to verify the inflammatory infiltrate subset data (CD45, CD38, CD68 and myeloperoxidase [MPO]-positive), and number of vessels. Kappa statistic was used to evaluate the degree of diagnostic concordance among examiners. Results: Inflammatory infiltrate was significantly more severe in P-I cases (P = 0.01), which showed a significantly higher percentage of plasma cells (P = 0.004) than in CP cases. Immunohistochemically, the percentage of leukocyte subsets was generally lower in CP (CD38: 32.05%; CD68: 6.45% and MPO: 8.62%) than in P-I (CD38: 61.13%; CD68: 9.09% and MPO: 7.47%) (CD38 P = 0.001, P = 0.955 and P = 0.463, for remaining subsets, respectively; Mann-Whitney U-test). The inter-observer diagnostic agreement was poor or slight (kappa = -0.18 to 0.13). Conclusions: Despite the significantly more severe general inflammatory infiltrate and plasma cells in P-I cases, it proved difficult to detect reliable differential morphological features based on histopathological images of these CP and P-I soft-tissue samples, obtaining low inter-observer and intra-observer diagnostic agreement. Conflict of interest statement: This investigation was partially supported by Research Groups #CTS-138 and #CTS-583 (Junta de Andalucía, Spain). No conflict of interest. This section presents a brief review of articles on dental implants considered of special interest for the reader, in order to encourage the development of research, the interest for data analysis and the attention to scientific publications. Your comments are welcome. Please contact Dr Michele Nieri at michelenieri@gmail.com.